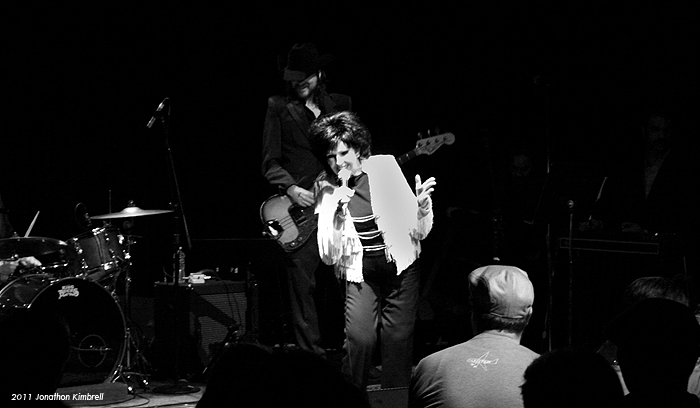 On a cool and slightly humid evening at Dallas’ historic Kessler Theatre in North Oak Cliff, music fans of all types crammed into the intimate venue like sardines to see Wanda Jackson, the proclaimed ‘Queen of Rockabilly’ give it all she literally had. The show, which was expected to begin with her set around 9:00pm, didn’t start until well after 10:30pm, due to a recent case of mild laryngitis the legendary singer had been battling. Most fans were certainly eager for the show to begin, however the crowd appeared to be quite patient and understanding with Jackson as she made her way through her setlist, something I haven’t seen much in Dallas concert-going crowds these last few years. Jackson’s backing band, Dallas’ own country flavored and incredibly talented The King Bucks, really got the audience warmed up with covers by Bob Dylan, Webb Pierce and Porter Wagoner, making the theatre feel like ‘Bob’s Country Bunker’ right out of the film “The Blues Brothers”, minus the obvious chicken wire. As Jackson hit the stage, she shimmered in her white fringe coat and jet black hair, excited to perform for everyone who showed up and stuck around. Jackson repeatedly apologized to the crowd for her tardiness and throat issues, as she sipped on a glass of Cabernet Sauvignon (the only thing that apparently would cure her ills) but promised to do her best. If not, she would make sure the theatre would allow her to come back and make things right. The audience got the rare treat of hearing Jackson talk about her life and career, especially with her time touring with Elvis Presley, then a young talent just starting out himself. Ladies, if you have ever wondered if Elvis was a good kisser, Jackson indeed confirmed that bit of info. Although, she later admitted that she met an even better kisser, and has been married to that man going on 50 years. White performed on and produced her latest record, “The Party Ain’t Over, released this past January 25th on Third Man Records, showing the world that the ‘Queen’ hadn’t abdicated her throne just yet. Jackson and her band immediately then tore into her cover of Amy Winehouse’s “You Know I’m No Good” from the new record. Despite a false start, she still gave the song the deserved authority much in the vein of Johnny Cash’s ‘American Recordings’ covers. Throughout the course of the evening, Jackson appreciated the audience so much that she ‘threatened to lock us all in the theatre and take her on tour with her’, which would have been perfectly fine by me. The highlights from her set were rockers “Funnel Of Love”, a B-Side to her classic ‘Right or Wrong’ from 1961, which featured some killer pedal steel slide guitar and piano. During “There’s A Riot Going On”, Jackson and band had the entire crowd singing along at a full ‘Jail House Rock’ gallop. 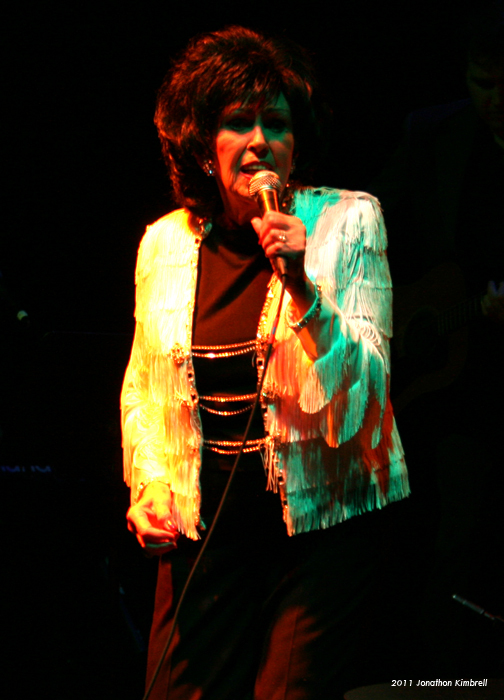 As Jackson took a personal moment to witness about her love and faith in Jesus Christ, the reverent crowd listened in earnest to her praise and how thankful she was for the life she had, which ultimately led into her heart-felt cover of Hank Williams’ “I Saw The Light”, a much needed standard hymn in every southern church. Before the show officially wrapped up around midnight with rendition of “Let’s Have A Party”, the audience was then treated to a fascinating Q&A session, where Jackson spoke fondly of her other musically talented friends (Johnny Cash, Roy Orbison, Buddy Holly, Jerry Lee Lewis and other Sun Records legends, among others) as well as how she felt an important sense of validation for being the first woman inducted into the Rock N’ Roll Hall Of Fame as an ‘early influence’ on rock and roll. Of course, a show this entertaining and important wouldn’t be complete without an encore, which Jackson and her band returned for a rocking medley of “Whole Lotta Shakin'”/”Rip It Up”/”Let’s Have A Party” that would make the Killer himself smile with pride. As health issues are usually to blame for poor live performances, Jackson stood steadfast and charismatic throughout the night, being as sweet and delightful as you could imagine your own rockabilly grandmother to be in such a situation, and not letting a sore throat defeat her. Her performance, though rough at times, still proved once again that rock and roll isn’t dead. It may cling on for dear life from time to time, but the ‘party certainly ain’t over’ until she says it’s over. Third Man Records To Release Charley Patton, Blind Willie McTell and Mississippi Sheiks Recordings!!! Bryan Gets Funky With Rebirth Brass Band At The Kessler!!! This entry was posted on Sunday, February 27th, 2011 at 12:42 pm	and is filed under Events, Music. You can follow any responses to this entry through the RSS 2.0 feed. You can skip to the end and leave a response. Pinging is currently not allowed. Excellent write up. Love her music. Kessler is Awesome!